The murder of JFK was the crime of the century. Everyone in America and the rest of the world was damaged forever. It even affected the way we thought about the country and about ourselves. This sensless event altered the entire decade of the 60s in shattering ways and impacted the lives of future generations. Murder, accident, or suicide, Marilyn Monroe's death is still an enigma today not because of conflicting clarifications of the facts, but because this dame of make-believe had been playing in a real and threatening world, and the crowned heads of that world were powerful enough to rewrite the chapter of her last hours. The infamous labor leader, Jimmy Hoffa, spent four years in prison for the crimes he committed as president of America's largest union, the International Brotherhood of Teamsters. Then, in August 1975, he suddenly disappeared. Federal investigator immediately turn to Mafia bosses Anthony Giacalone and Anthony Provenzano, both of whom reportedly agreed to meet with Hoffa on the very day of his disappearance. But while the suspects and motives were clear, evidence proved far more elusive. 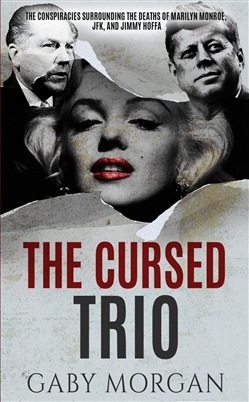 Acquista The Cursed Trio: The Conspiracies Surrounding the Deaths of Marilyn Monroe, JFK, and Jimmy Hoffa in Epub: dopo aver letto l’ebook The Cursed Trio: The Conspiracies Surrounding the Deaths of Marilyn Monroe, JFK, and Jimmy Hoffa di Gaby Morgan ti invitiamo a lasciarci una Recensione qui sotto: sarà utile agli utenti che non abbiano ancora letto questo libro e che vogliano avere delle opinioni altrui. L’opinione su di un libro è molto soggettiva e per questo leggere eventuali recensioni negative non ci dovrà frenare dall’acquisto, anzi dovrà spingerci ad acquistare il libro in fretta per poter dire la nostra ed eventualmente smentire quanto commentato da altri, contribuendo ad arricchire più possibile i commenti e dare sempre più spunti di confronto al pubblico online.